Time to gear up and roll out with the new Spring Motorclothes Collection. Harley-Davidson® Men's Heather Grey Sublimated Embroidered Slim Fit Tee features an embroidered patch on the right chest, and embroidered winged Bar & Shield® logo on the back. This tee features a slim fit cut that is narrower throughout. Like it roomier? Size up. 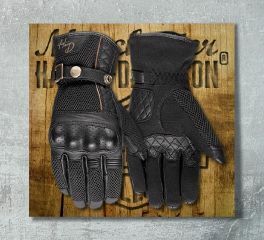 Men's Harley-Davidson® Farson Leather Full Finger Gloves are your ideal riding partner. Breathable insert keep you comfortable for the ride. 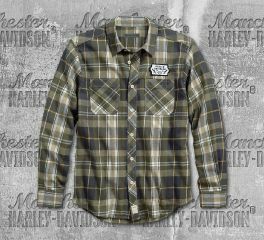 Harley-Davidson® Men's Plaid Lightning Bolt Slim Fit Long Sleeve Shirt is perfect for casual occasions. 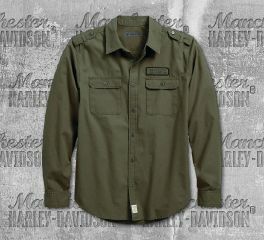 It features a full button front, two chest pockets, button cuffs, and Harley-Davidson® patch on the upper left chest. This long sleeve shirt features a Slim fit cut that is narrower throughout. Like it roomier? Size up. 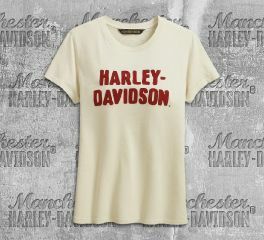 Harley-Davidson® Women's Chain Stitched Short Sleeve Tee is made from 100% cotton jersey, washed for softness. The garment dyed with pigment spray for lived-in look. This short sleeve tee features a chain stitch embroidered graphics, and rib knit neckline. It plays well with jeans and a favorite hoodie. 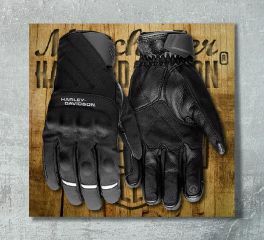 Women's Harley-Davidson® Cowley Leather Full Finger Gloves are your ideal riding partner. Harley-Davidson® Men's Grape Leaf Radial Logo Slim Fit Short Sleeve Tee is not just a simple tee, it features a unique radial Harley-Davidson® lettering and Bar & Shield® logo printed on the left chest and on the back. Wear it with pride, and it will stand out in the crowd. Featuring a Slim fit cut that is narrower throughout. Like it roomier? Size up. 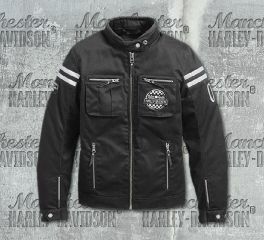 Harley-Davidson® Women's Neenah CE-Certified Riding Jacket is Abrasion-resistant 55% cotton, 45% polyester. Polyester mesh TPU lining. Removable polyester taffeta zip-out full-sleeve quilted liner with one horizontal pocket. EN 1621-1 CE-approved removable body armor at elbows and shoulders. Back body armor pocket fits CE Level 1 Back Armor (98150-17VR, sold separately). Harley-Davidson® Men's Grape Leaf HDMC® Canvas Slim Fit Long Sleeve Shirt is a versatile look that's at home with cargoes or jeans. Enzyme wash gives it lived-in style while button epaulets add structure. This men's long sleeve shirt features a Slim Fit that is narrower throughout. Like it roomier? Size up. Harley-Davidson® Women's Almena CE-Certified Leather Jacket is made from Heavyweight abrasion-resistant buffalo leather with wax finish. Polyester mesh lining. Removable polyester taffeta zip-out full-sleeve quilted liner with two horizontal pockets. EN 1621-1 CE-approved removable body armor at elbows and shoulders. Back body armor pocket fits CE Level 1 Back Armor (98150-17VR, sold separately). Meets or exceeds CE requirements in abrasion resistance, impact testing, and seam bursting for personal protective clothing. Crafted by the top manufacturer of baseball caps, this Men's Black Embroidered Appliqué Cap makes a bold statement or two. Just as you would expect from Harley-Davidson®. 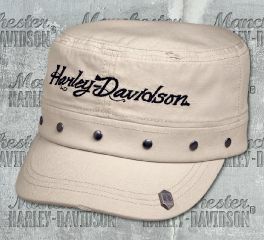 Harley-Davidson® Women's Stone Studded Flat Top Cap features an embroidered Harley-Davidson® on front, and embellished with studs. Rear adjustment strap has the B&S® logo on the clasp. 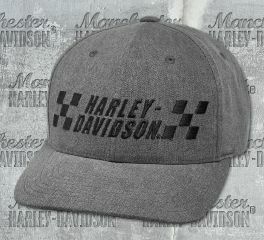 Harley-Davidson® Men's Stone Grey Checkered Baseball Cap features an embroidered Harley-Davidson® lettering on the front, stitched grommets for ventilation, and adjustable strap. Fitted styling. 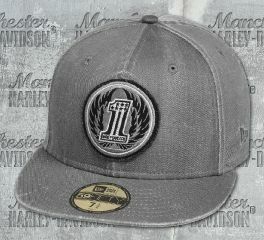 Crafted by the top manufacturer of baseball caps, this Men's Grey Embroidered No.1 Patch 59FIFTY® Cap makes a bold statement or two. Just as you would expect from Harley-Davidson®. 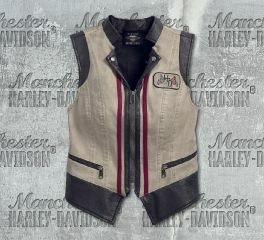 Harley-Davidson® Women's Stone Dirty Wash Denim Vest features a snap collar, full front zipper, and two zippered pockets. 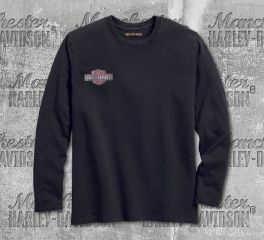 Embroidered patch on left chest, and embroidered Harley-Davidson® on the back. 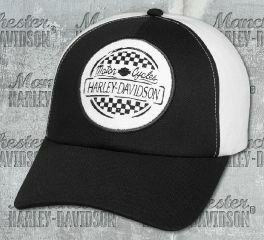 Harley-Davidson® Women's Black & White Race Patch Cap is perfect for cap lovers. 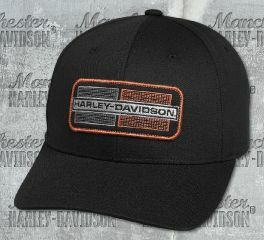 It features a slide back closure which can be adjusted on desired fit, and an embroidered Harley-Davidson® patch located on the front. Adjustable strap with B&S® engraved clasp.